It started with a thank you gift: a small jade plant from my dear ones for watching my granddaughter. I dashed off to the store to buy a cute container. Instead I came home with five new varieties. I justified this purchase by reusing an old container I had laying about. Why plant just one lonely jade plant in a container, when I can add others and enjoy the container all that much more? After all that’s the basic premise for adding multiple annuals when planting containers. Sometimes the obvious whisks past me but fortunately, not that day. This may not have been the ideal year to begin my succulent garden. I planted the container in June and we promptly had 19 inches of rain that month. Fortunately–that is, before a storm came and destroyed it–my red table umbrella provided shelter from the raindrops when I was astute enough to move the container. This small garden has flourished. I attribute most of that to using the appropriate soil. Each year I am more cognizant of how important the soil is to successful gardens. I bought a mix specifically designed for succulents. The jade in the center may have received more moisture than it ideally needs due to the excessive rain in June, but it seems very happy and has more than doubled in size. When looking at the photo above, the jade (Crassula spp.) is surrounded container by five varieties. Starting from the front center and moving left, are: string of pearls (senecio rowleyanus); ghost plant (graptopetalum paraguayense), princess pine (crassula mucosa pseudolycopodiodes),topsy turvy (echeveria) and elephant plant (crassula portulacaria afra). I will bring this inside for winter enjoyment and have already staked out the perfect location in my home office. 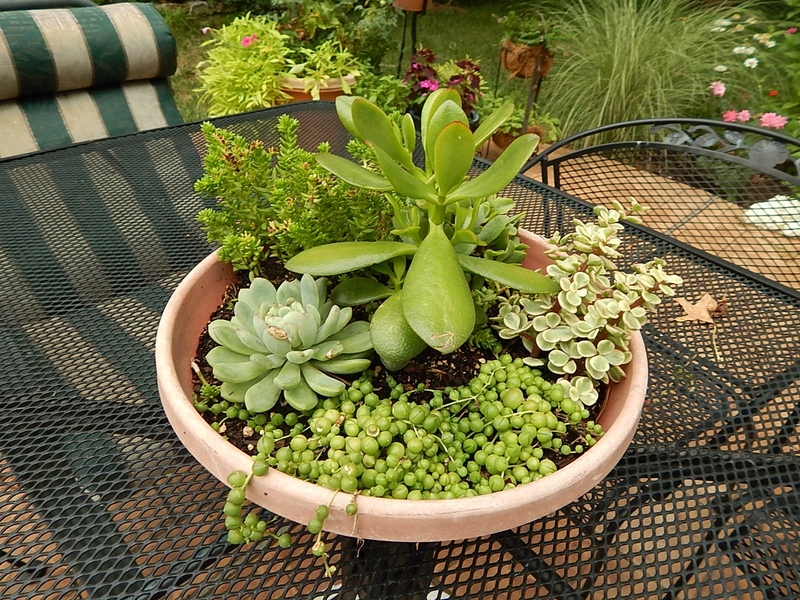 Do you enjoy a succulent garden? And do you have any tips for bringing it in from the outside? Categories: Musings | Tags: elephant plant, ghost plant, jade plant, princess pine plant, string of pearls, Succulent containers | Permalink.